Africa has always been one of the most difficult continents to fully understand and to carry out diplomacy with any lasting effect. It is also the place where we have needed to be engaged with out best people and with effective assistance programs that reached the general population and not squandered or wasted especially on wars and civil strife. 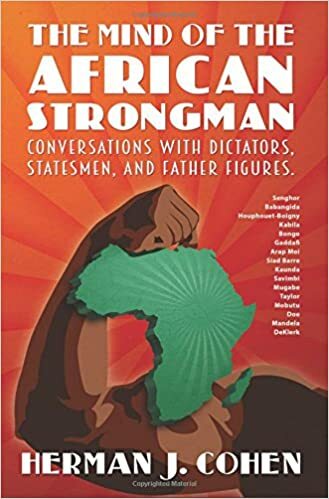 This book “The Mind of the African Strongman: Conversations with Dictators, Statesmen, and Father Figures” (New Academia Publishing, 2015, paperback), is filed with person-to-person meetings and dialogues of the key leaders of Africa over decades and provides Ambassador Cohen’s wise observations of their views, weaknesses, and strengths. In the process the reader gets an insight of the many difficulties of achieving prosperity for the people and also the many barriers to development and real democracy. Ambassador Cohen knows better than just about anyone of his generation and beyond the challenges and pitfalls of dealing with the wide variety of conditions, forces and wide range of leaders of African nations especially in their post-colonial era. In this book he sets forth as good a look at the leaders that shaped or misshaped that contentment in this key post-colonial period. The books chapters are like a short history of African leadership from a personal perspective of a U.S. diplomat who was engaged intensively with these leaders and the problems of that period. So we gain an insight on the strengths and weaknesses and difficulties covering such countries as Senegal, Cote d’Ivoire, Gabon, Kenya, Zimbabwe, Zambia, Congo, Zaire, Nigeria, Libya, Somalia, Angola Liberia, and not least South Africa. In each case and in their own chapters these countries’ first leaders are portrayed with incisive insight and their inner personalities are given some light. Africa has a long history of upheavals, conflicts and abject poverty, the hope was that progress could be made by independence. That promise however was moved forward in some cases and sadly in others was held back by a multiplicity of problems and poor leadership and corruption. In Cohen’s summing up chapter he says “The African leaders portrayed in this volume were typical of their generation. Their outlooks were somewhat contradictory. They rejected colonial-era institutions, yet they adopted some colonial-era socioeconomic theories.” ”He adds: “The newly independent African nations of the early 1960s rejected Western multiparty democracy and all the trappings of open societies. He notes they also used the African “tradition of consensus building, but one party sates. He argues that with a new generation of leaders, there was more demand for freedom and often it resulted in less authoritarian rule along with the rise of independent media, and rise of some opposition parties and some private enterprise. Looking at 2015 Cohen notes that Africa was making progress on political and economic fronts. But he holds that in some countries the process was far from full democracy. Cohen ends with the hope for the development of good leaders that understand the needs of their people and are modern in their outlook on technology, listen to their people, and wake up in the morning determined to do good. He points to South Africa as a possible modal for other African countries. American policy he notes is taking a positive attitude towards developments in Africa. But he seems to think we have taken too light a hand and avoided “blunt talk,” letting the World Bank and IMF do the hard words. He ends by writing that “President Obama appears more inclined that his predecessors toward “tough love” with respect to Africa.” He hopes President Obama will talk more openly about corruption and human rights abuses. He argues he can get away with a harder line and urge a move towards good governance. He worries also about growing unemployed youth becoming “explosive.” Amb. Cohen says there are grounds for some optimism in Africa “in the second decade of the twenty-first century. This book, for those interested in the recent history of Africa and its many problems and the role and impact of it’s early leadership and what inheritance they gave to Africa, will make for exciting and insightful reading and a lot of thought about the landscape of Africa today. Washington DC, 2015, paperback. We welcome your comments!